Tile of fritware, hexagonal, painted in shades of blue and turquoise in the centre with a rosette, surrounded by floral designs symmetrically arranged on a white ground. In November 1892, the South Kensington Museum bought more than 500 tiles of different types from Mrs Elizabeth Edkins of 12 Charlotte Street, Bristol, for £125.0s.0d. 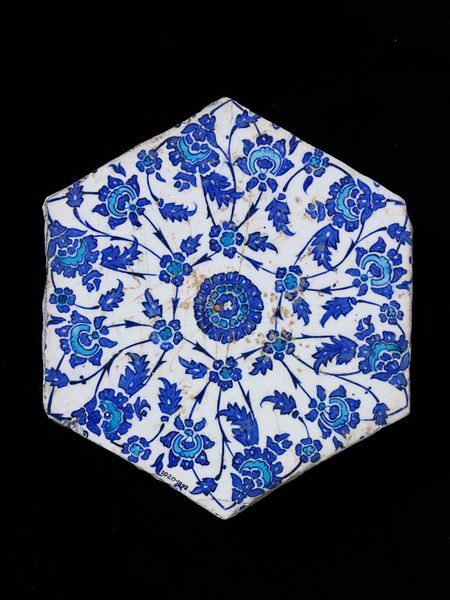 The tiles purchased from Mrs Edkins were accessioned as nos 920 to 1435-1892. The vendor’s late husband, William Edkins, had kept the tiles in drawers in a specially made cabinet, and an accession number was ascribed to each tile on the basis of an inventory that listed them drawer by drawer. 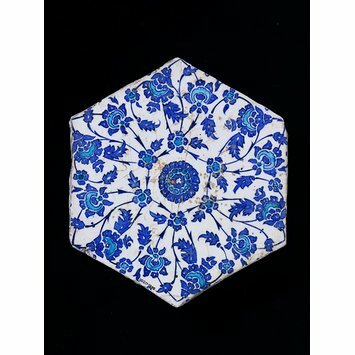 The group included 11 tiles now identified as coming from the Çinili Hamam in the Zeyrek district of Istanbul. Seven triangular tiles were kept in drawers 2 and 11 (961-1892 and 1042 to 1043A-1892 respectively), with the six in drawer 11 “forming a hexagon”. Two hexagonal and two rectangular border tiles were kept in drawers 8 and 12 (1019 to 1021-1892, and 1058-1892, respectively). This group now consists of only 10 tiles, as 1042C-1892 was transferred to the Museum’s Circulation Department, which organised travelling exhibitions around Britain, in 1909. It was written off as irretrievably lost in 1952.